We’ve got book trailers on the brain these days. For the past five weeks we’ve been working with Hilary Leung (author of Ninja, Cowboy, Bear) to lead a group of exceptional young writers in the creation of a brand new, wholly original, and totally wacky picture book. Last week was the final week of production before the pages were sent off to the printer for publication, which can only mean one thing: it’s time to toot our own horn! Our devoted volunteer and expert photog, Scott, is putting together a book trailer to announce the impending arrival of our publication. Story Planet’s Top 5 Favourite Book Trailers of ALL TIME! In a totally unbiased move, number five on our top five list comes from our story-making collaborater, Hilary Leung himself. This trailer is bright, fun, and full of energy, which is exactly what you can expect from a Ninja Cowboy Bear book. What’s more, the key words give you a taste of what you’re getting into, without giving too much away. Some jazzy background music, a draws-you-in opening sequence, beautiful illustrations, and kooky characters – what more could you ask of a book trailer? This trailer is all about building curiosity and intrigue in the viewer. What kind of adventures could a girl and her squirrel possibly get up to? What has Flora’s mother got against Ulysses? And what has a vacuum got to do with it? In a completely different approach, Lemony Snicket uses his book trailer to reveal everything. The book is called 13 words, and that’s exactly what this trailer gives us: all 13 words, one by one, peppered with hilarious digressions in Snicket’s characteristically witty manner. And yet, I still want to read the book! Knowing what the words are – which range from “hat” to “mezzo soprano” – makes the viewer more curious to find out how Snicket squeezes them all into a single story. Beautiful and terrifying animation swirls through each frame, enticing you into Conor’s nightmare. A pallet of sombre colours and the plaintive sighs of a single violin create an eerie world that you are eager and afraid to enter at the same time. An endorsement from Philip Pullman definitely doesn’t hurt, either! Two Lemony Snicket books in a single top 5 list, you ask? Hear me out. This trailer is our favourite because it combines all the necessary elements: a spooky soundscape, a cliffhanger that reveals just enough while still keeping you on edge, and scenes of real kids engrossed in the book. To top it all off, the trailer is narrated by none other than the master of imagination, Neil Gaiman. Now that you’ve seen the trailers – why not buy the books? All these titles (and more!) are available for purchase at the ITA. And be sure to watch this space for our very own book trailer, and eventual book, which will be coming soon to a Story Planet near you! Each month we will pit two worthy opponents against each other, and YOU will decide with your donation which is the mightier. The two contenders in this first round are Star Trek and Star Wars. Which one will reign in this battle of the stars? 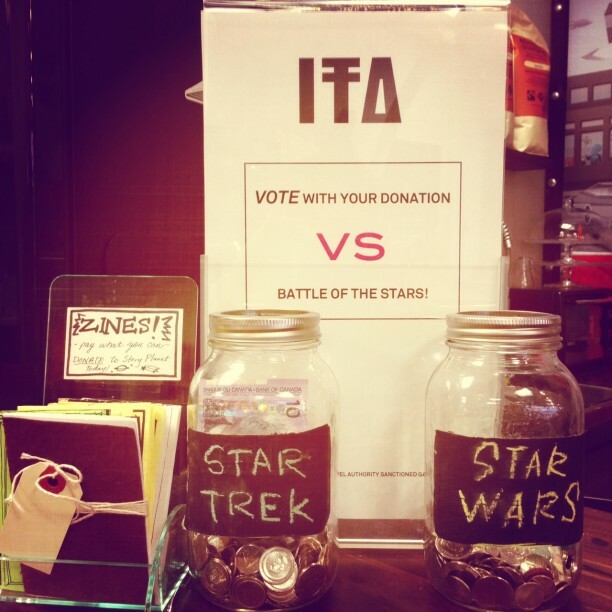 There is only ONE week left to vote for your favourite star before we make way for a new battle in April, so come into the ITA to make your donation and make your choice! All proceeds go to supporting Story Planet programming.